Travel through Brazil great cities. Visit Rio de Janeiro, Manaus, Iguassu Falls and São Paulo. Arrive Rio de Janeiro 3 Nights > Flight Manaus 3 Nights > Flight Iguassu Falls 3 Nights > Flight São Paulo 2 Nights & Leave. FD Sugar Loaf wit City tour + Corcovado with beaches + lunch – Over a million tourists a year visit the world famous Pão de Açúcar, or Sugar Loaf Mountain in English, which has become an iconic symbol of the city of Rio de Janeiro. Rising up from small peninsula at the entrance of Guanabara Bay, its name is said to refer to its resemblance to the traditional shape of concentrated refined sugar loaf. The tour is done in two steps by glass cable-cars. The first cable-car takes passengers to the top of Urca Hill, which rises 215 meters above sea level and offers spectacular views of the entire bay its islands. From Urca Hill, passengers continue in a second cable car to the top of Sugar Loaf which rises 395 meters above sea level and offers a 360 degree view of the entire city including Botafogo and Copacabana Beaches, the Corcovado and downtown Rio.We will depart from the hotel to visit the Christ Statue, which was recently elected as one of the seven modern wonders of the world, which sits 2,300 above sea level, atop Corcovado Hill. Following a scenic drive along the Rodrigo de Freitas Lagoon, we will arrive at the foot of the hill from where we ill embark on a small train which climbs the beautiful mountain. Upon reaching the top, visitors will experience a panoramic view of Rio de Janeiro and discover why it is known as the “Marvelous City”! Tour also includes a drive along Rio’s famous beaches. Botanical Garden and Historical Rio with Lunch: The Botanical Garden, created in 1817 by the king D.João IV, bound for the culture of exotic plants brought form all over the world, is a unique park due its the variety of species. Among them, we can find the Imperial Palm Trees, huge water lilies (Victorias-Regias), and some Red Wood trees (Pau Brasil) almost extinguished in the Atlantic Forest. Also, in its famous greenhouse, there are more than 500 kinds of orchids. Learn about old Rio as we walk, with a specialized guide, through the historical city’s center. The architecture and the traditional commerce provide a warm welcome to visitors. 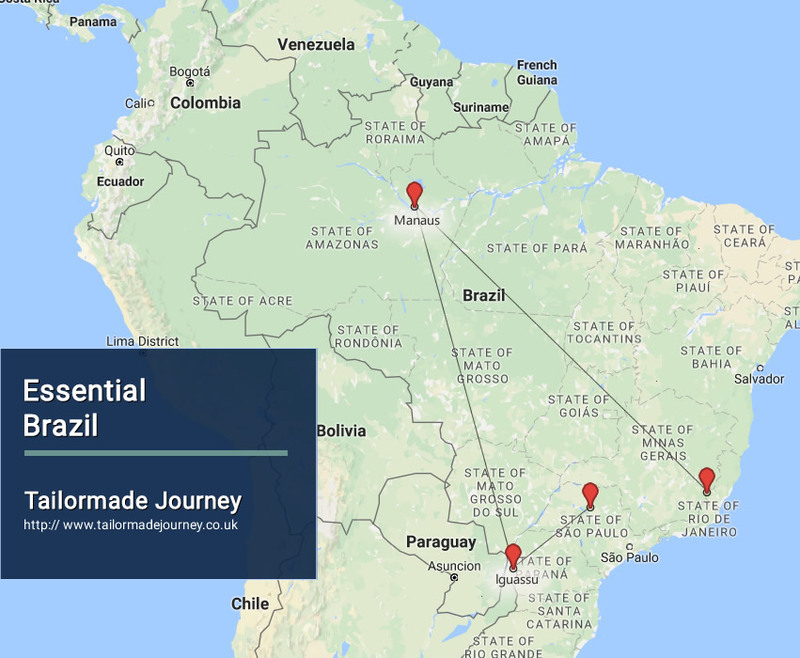 This tour makes stops at the São Bento Monastery, Praca XV (square), Candelaria Church, França-Brasil House, old Market Street, Imperial Palace, and will finish at the famous delicatessen in Rio – Confeitaria Colombo. Breakfast followed by a Nature-Hike. Lunch. After a short rest, visit to the home of local Amazonian residents (“natives”) with an opportunity for Piranha Fishing. Overnight Stay at the Hotel in Manaus. Overnight Stay at the Hotel in Iguassu. Bird Park: The Bird Park integrates tourists with the local nature of the region. Visitors walk along the trails through the forest and have the opportunity to see and get close to some wonderful bird species native to Brazil, some of which are classified as endangered. HD City tour: We start our tour at the famous BairroOrintal with its typical Japanese decoration. Then we proceed till the Cathedral (Praca da Se) at downtown area. From this point we walk towards the dead center of São Paulo (Tropic of Capricorn) and visit the monument “The Immortal Glory of the founders of the city”.Back to the van/car/bus we go to Higianopolis, the hard and soul of the modern Jewish community and where the rich families used to live during Old Republic era.Next stop will the most important financial center of South America the Paulista Avenue, among six different stiles of architecture there is MASP (Museu de Arte de São Paulo), considered one of the best museums in the world. From that point we go to Governor’s Palace, we finish at the green area Ibirapuera Park and the Oscar Niemeyer buildings (1.6 million square meters) the largest of our 32 public squares.